North Coast Water Quality Control Board. 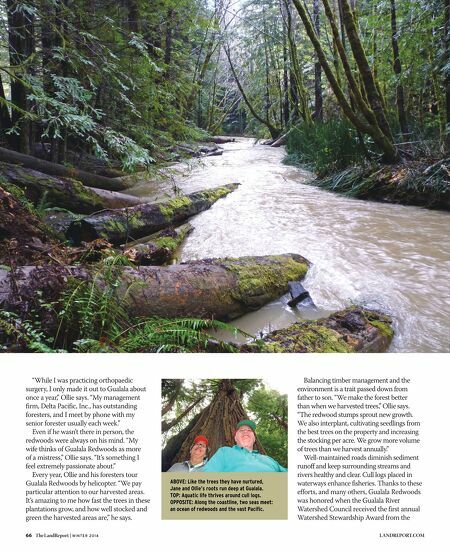 "We've taken strides to protect Gualala Redwoods for our children and our grand- children," Ollie says. He pauses momentarily. "And now we're selling it to a new generation of people. They're going to have something better than what our family bought." 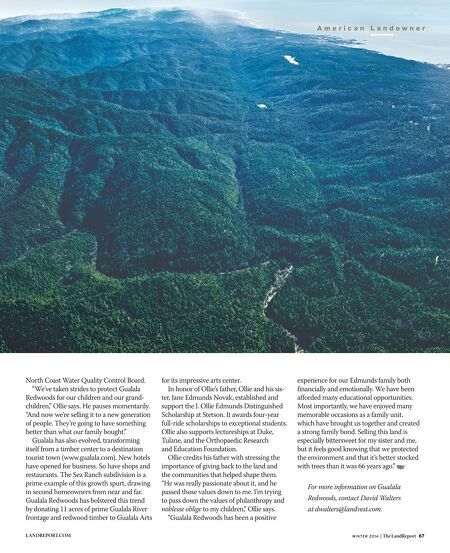 Gualala has also evolved, transforming itself from a timber center to a destination tourist town (www.gualala.com). New hotels have opened for business. So have shops and restaurants. The Sea Ranch subdivision is a prime example of this growth spurt, drawing in second homeowners from near and far. Gualala Redwoods has bolstered this trend by donating 11 acres of prime Gualala River frontage and redwood timber to Gualala Arts for its impressive arts center. In honor of Ollie's father, Ollie and his sis- ter, Jane Edmunds Novak, established and support the J. Ollie Edmunds Distinguished Scholarship at Stetson. It awards four-year full-ride scholarships to exceptional students. Ollie also supports lectureships at Duke, Tulane, and the Orthopaedic Research and Education Foundation. Ollie credits his father with stressing the importance of giving back to the land and the communities that helped shape them. "He was really passionate about it, and he passed those values down to me. I'm trying to pass down the values of philanthropy and noblesse oblige to my children," Ollie says. "Gualala Redwoods has been a positive experience for our Edmunds family both financially and emotionally. We have been afforded many educational opportunities. Most importantly, we have enjoyed many memorable occasions as a family unit, which have brought us together and created a strong family bond. Selling this land is especially bittersweet for my sister and me, but it feels good knowing that we protected the environment and that it's better stocked with trees than it was 66 years ago." W I N T E R 2 0 1 4 | The LandReport 67 LANDREPORT.COM A m e r i c a n L a n d o w n e r For more information on Gualala Redwoods, contact David Walters at dwalters@landvest.com.